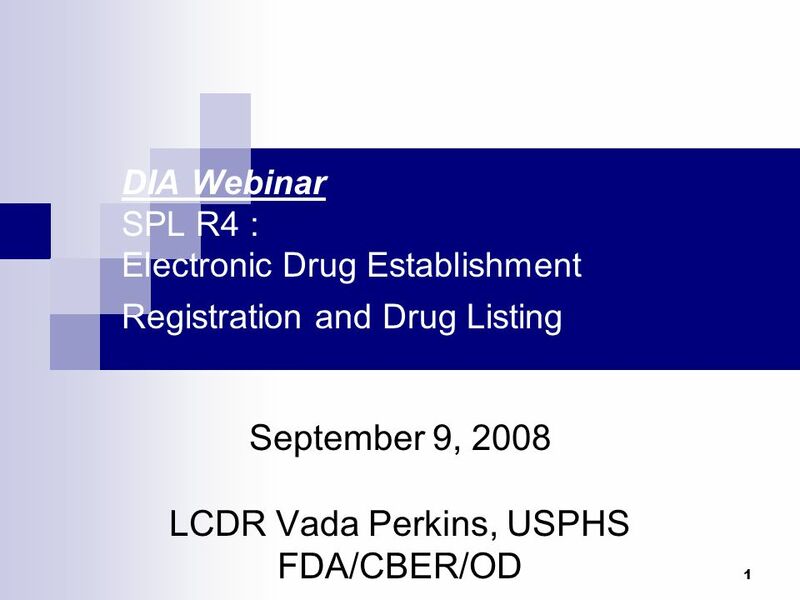 1 DIA Webinar SPL R4 : Electronic Drug Establishment Registration and Drug Listing September 9, 2008 LCDR Vada Perkins, USPHS FDA/CBER/OD. 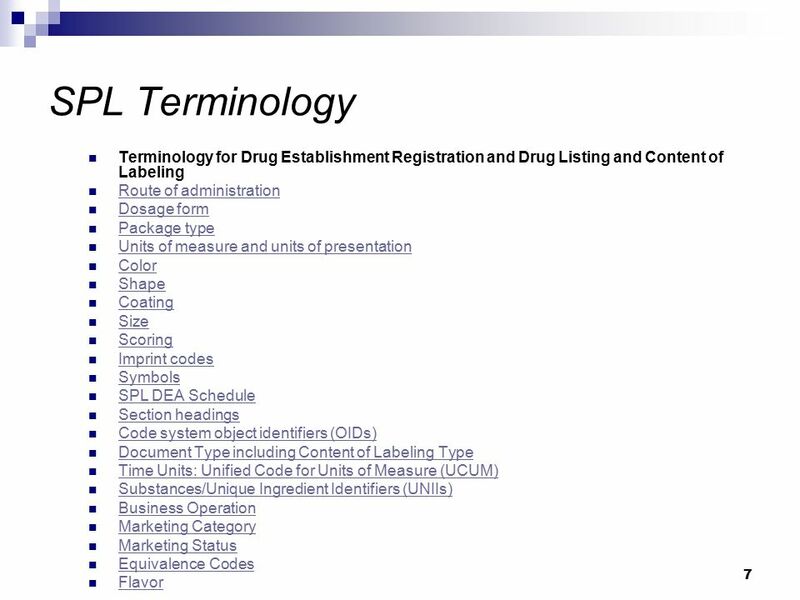 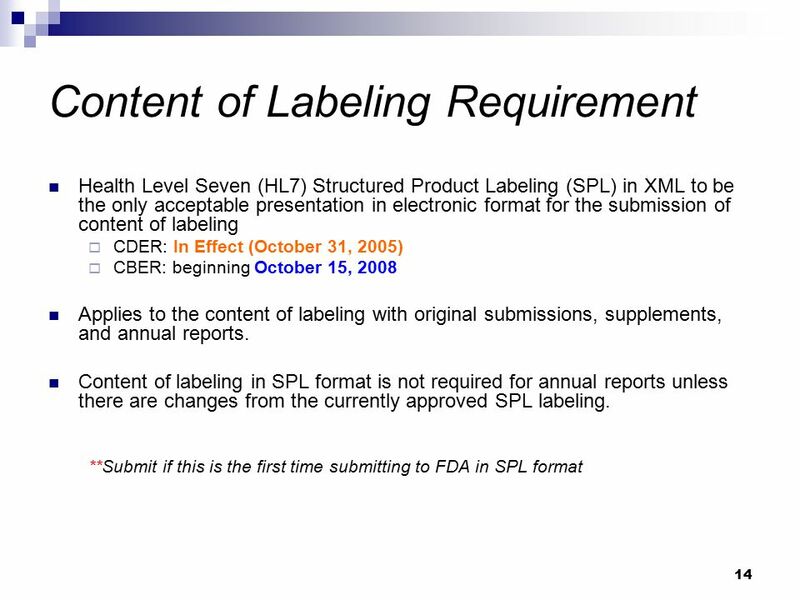 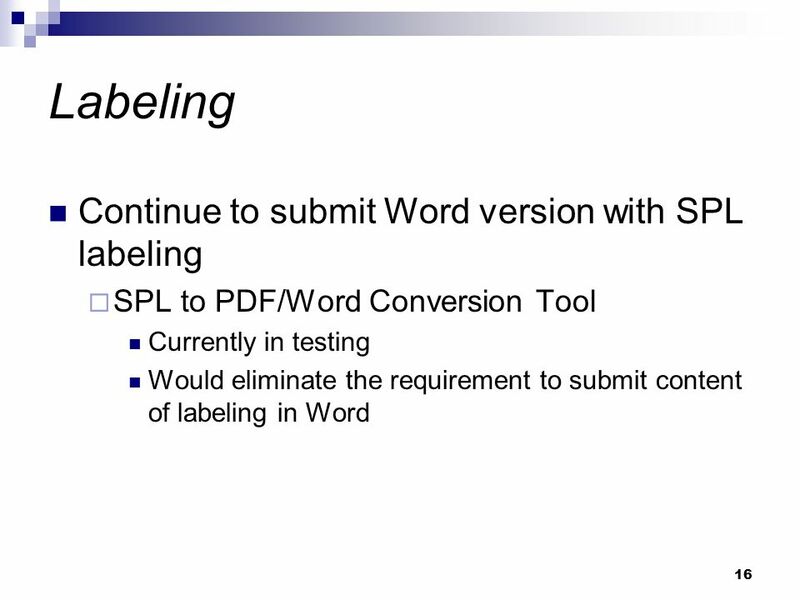 6 6 SPL Terminology Verification Terminology for Drug Establishment Registration/Drug Listing and Content of Labeling Drug Registration and Drug Listing and Content of Labeling Terminology Lists in XML format – Drug Registration and Drug Listing and Content of Labeling Terminology Lists in XML format "Structured Product Labeling Validation Procedures for Drug Establishment Registration and Drug Listing" "Structured Product Labeling Validation Procedures for Drug Establishment Registration and Drug Listing"
10 10 UNII Assignment In order to receive a UNII, an ingredient must be a ‘substance’, which is defined as “Any physical material that has a discrete existence, irrespective of origin.” Products will not be assigned a UNII. 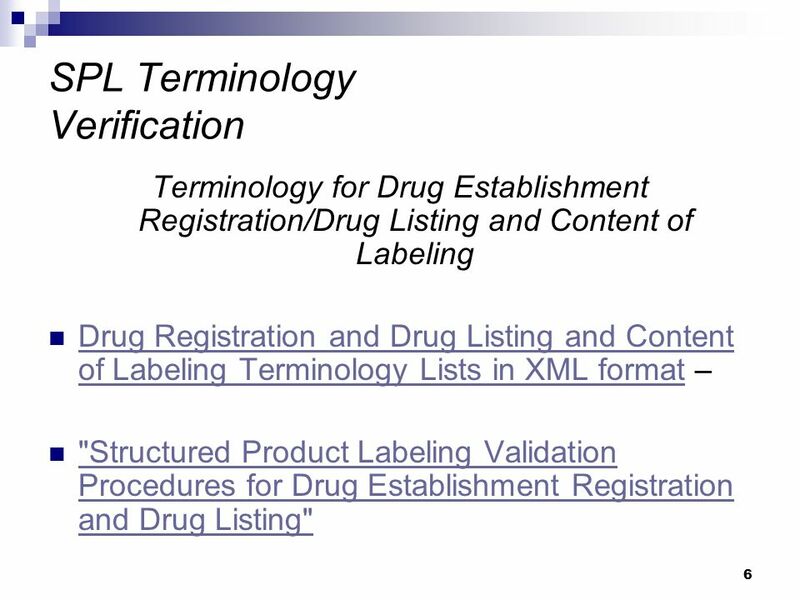 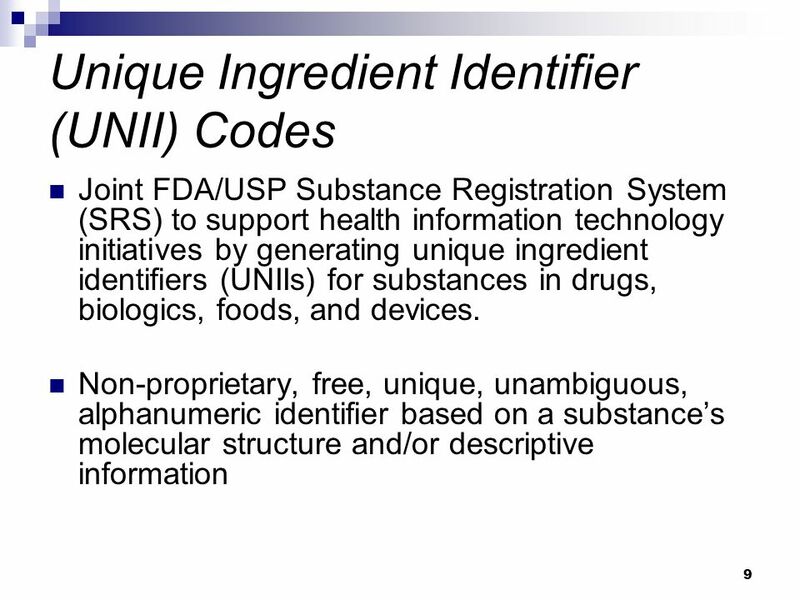 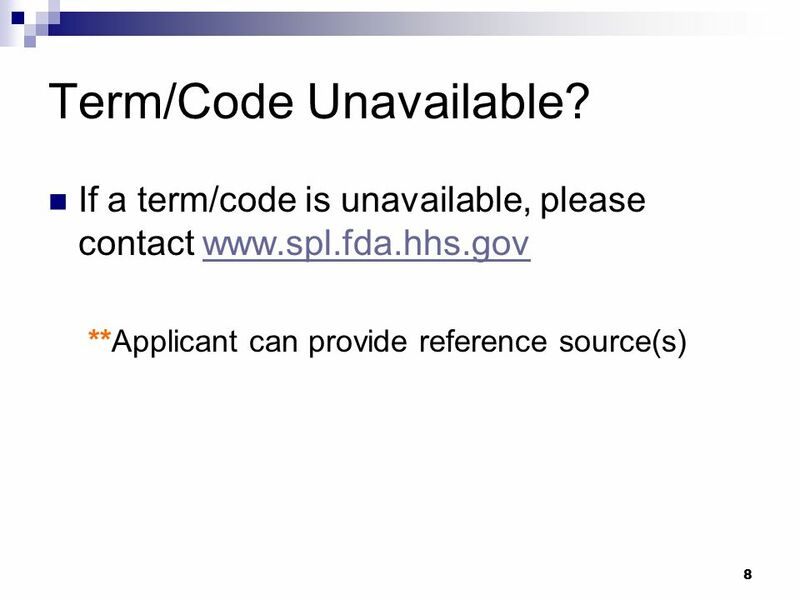 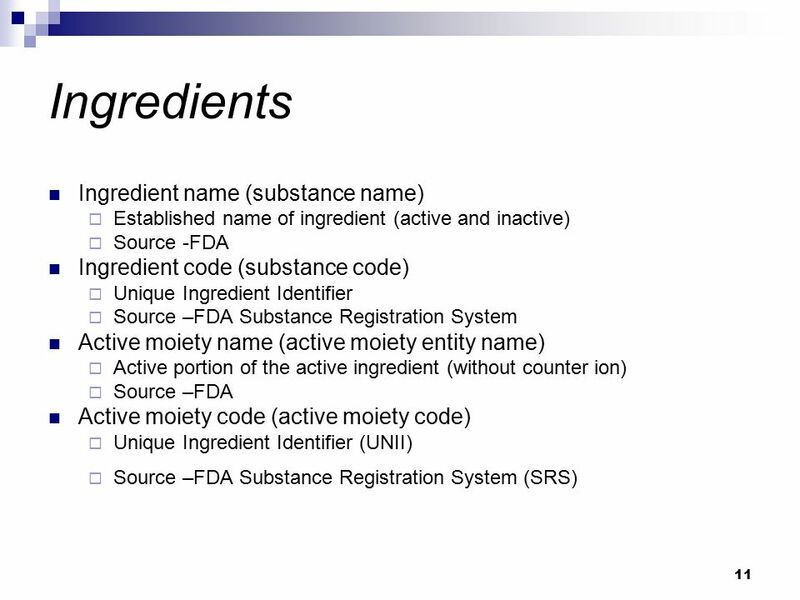 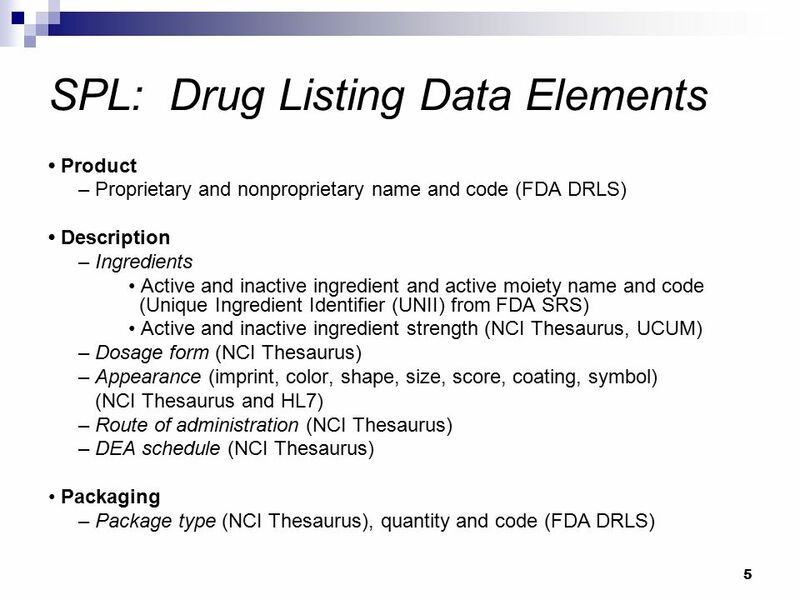 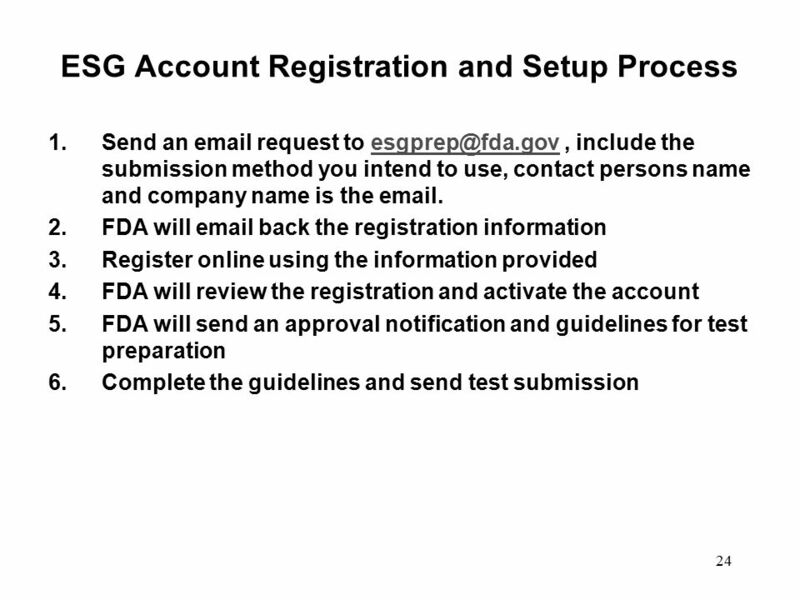 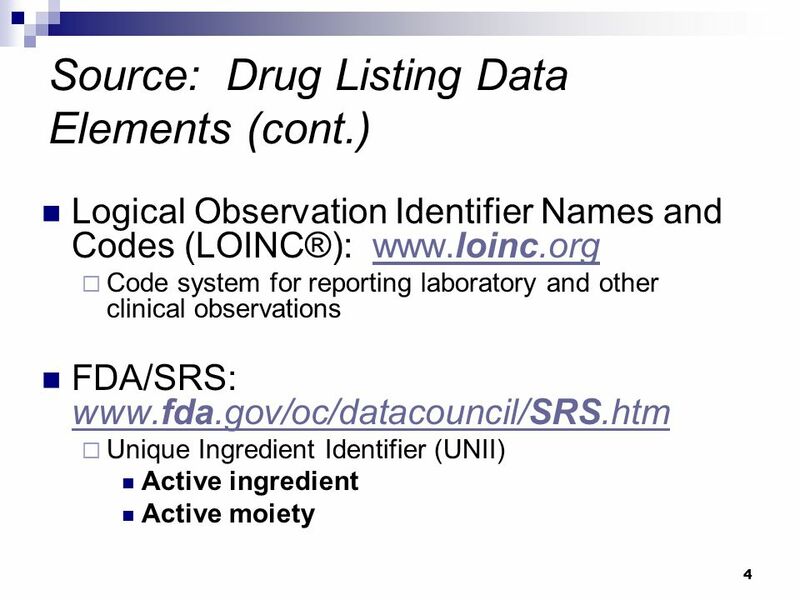 Download ppt "1 DIA Webinar SPL R4 : Electronic Drug Establishment Registration and Drug Listing September 9, 2008 LCDR Vada Perkins, USPHS FDA/CBER/OD." 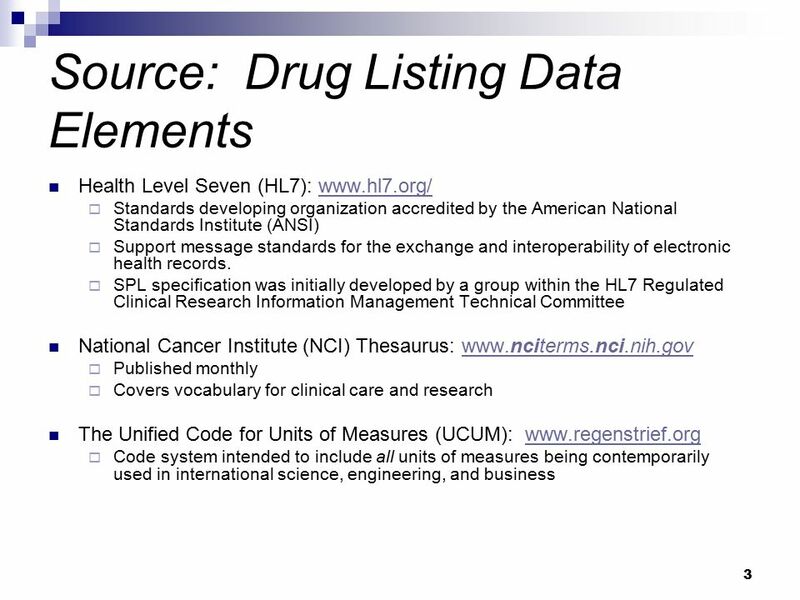 Los Angeles Biomedical Research Institute at Harbor-UCLA Medical Center eRA: Electronic Research Administration Wednesday, May 10, 2006. 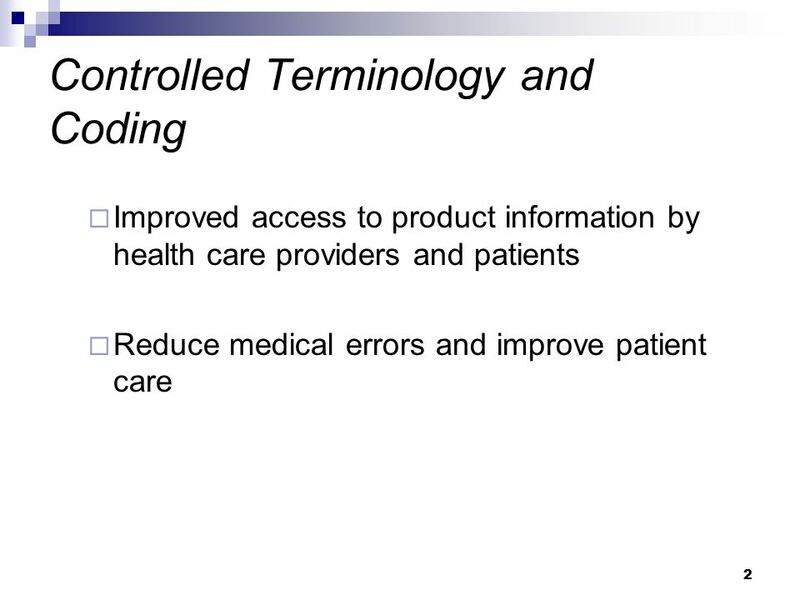 TEACHER CERTIFICATION TUTORIAL TIMS = Teacher Information Management System BY: Dr. Cindy Ferraro and Ginger Daddona. 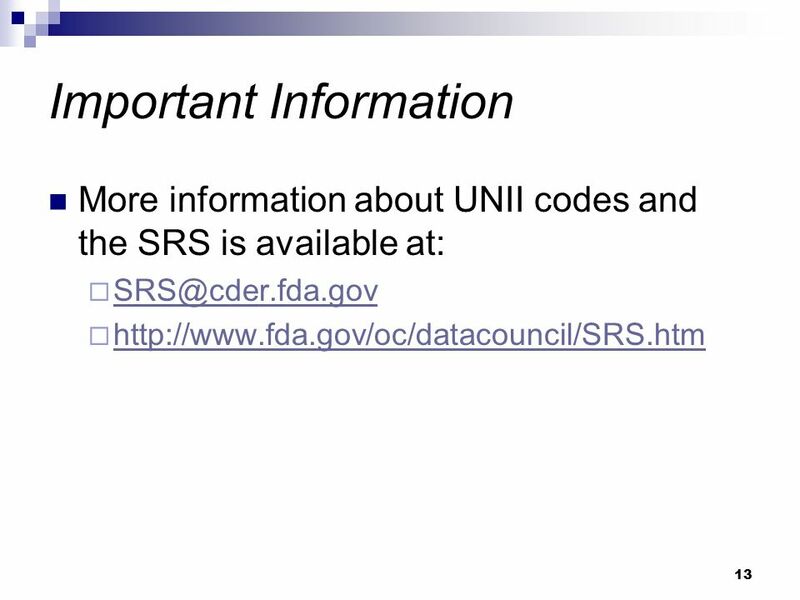 TM Aggregate Reporting of Pandemic Influenza Vaccine Doses Administered Discussion of Option 1: Data Exchange Using CDC’s CRA System and State Immunization. 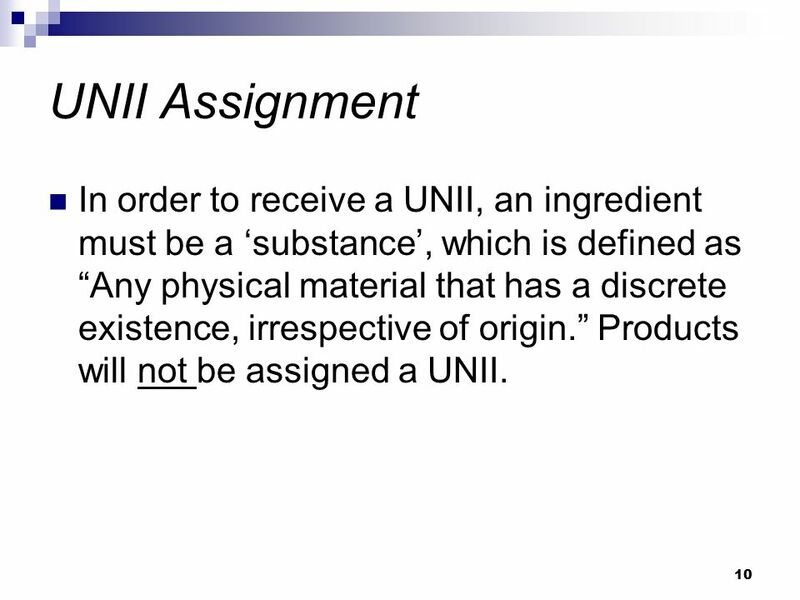 Assures that feed… –has the identity and strength, which it purports –meets the quality, purity, and safety requirements, which it is represented to possess. 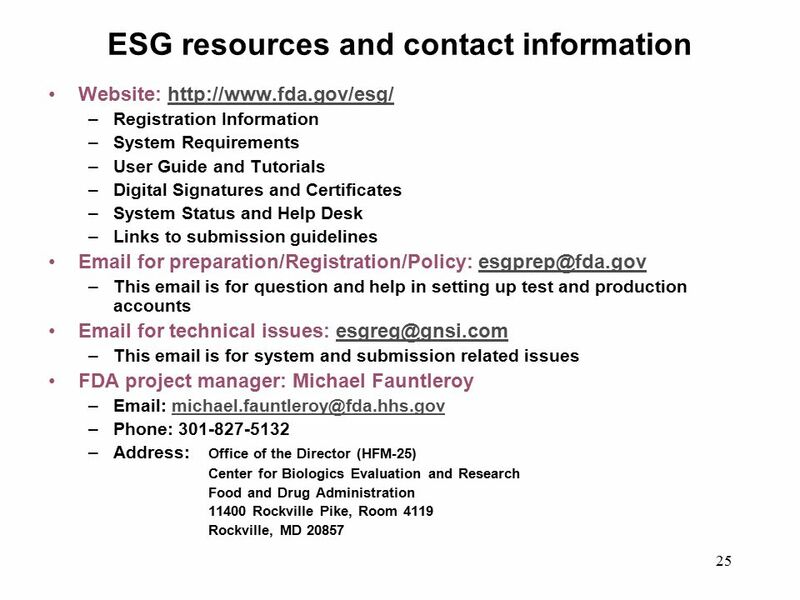 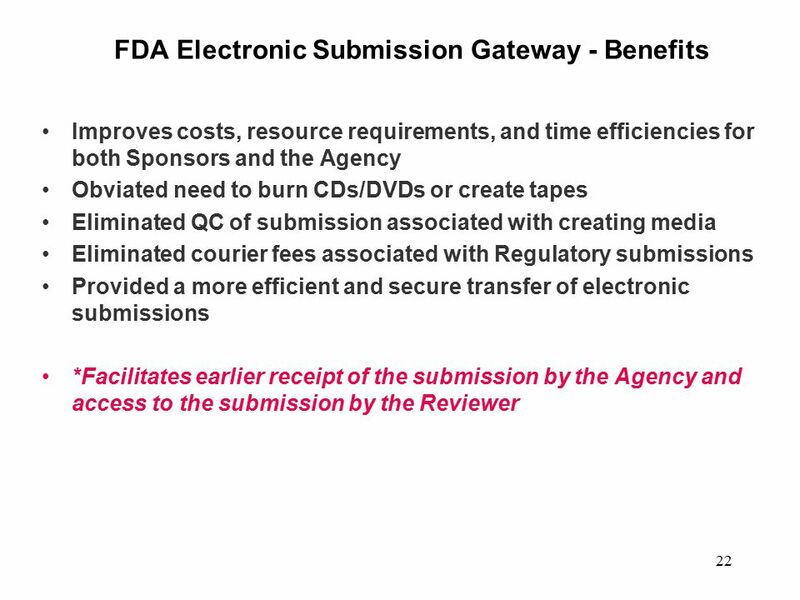 Electronic Submission of Medical Documentation (esMD) for Medicare FFS Presentation to HITSC Provenance Workgroup January 16, 2015. 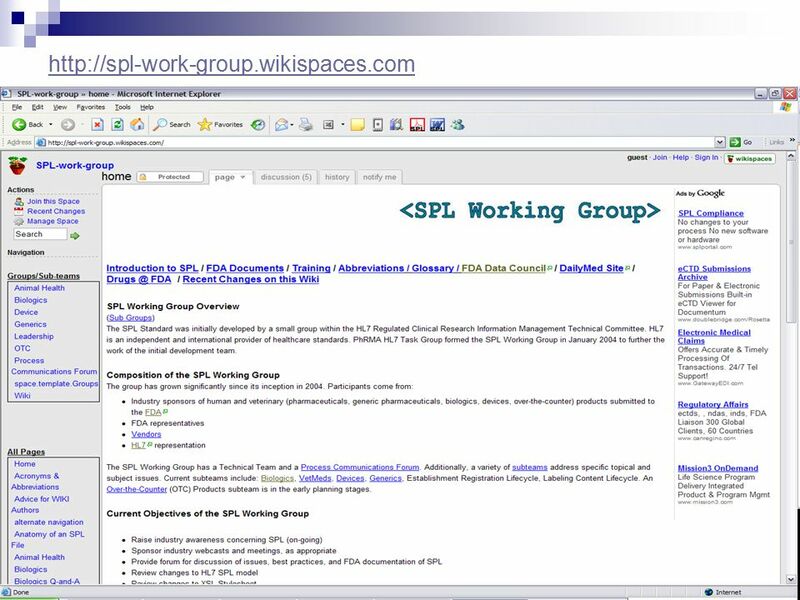 NASFAA 2003: Reconnecting With Students!. 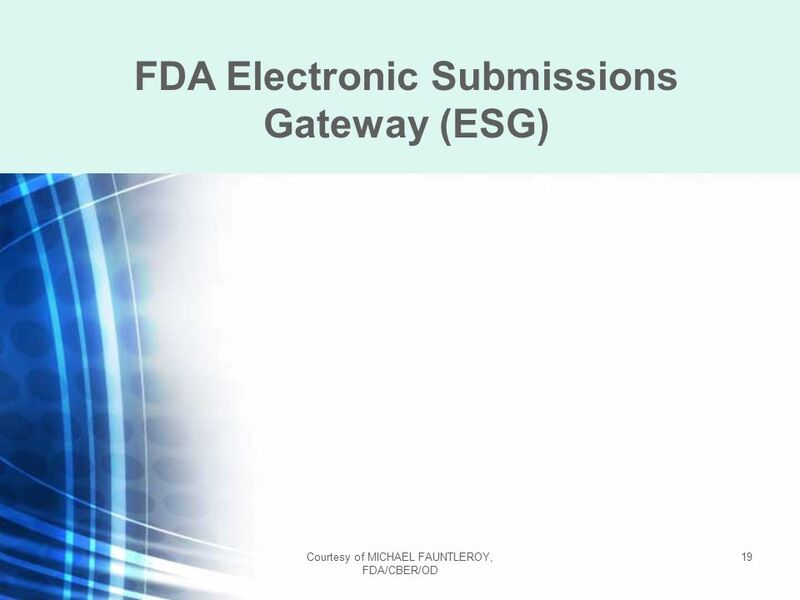 2 eZ-Audit – Electronic Submissions of Financial Statements and Compliance Audits Session #105. 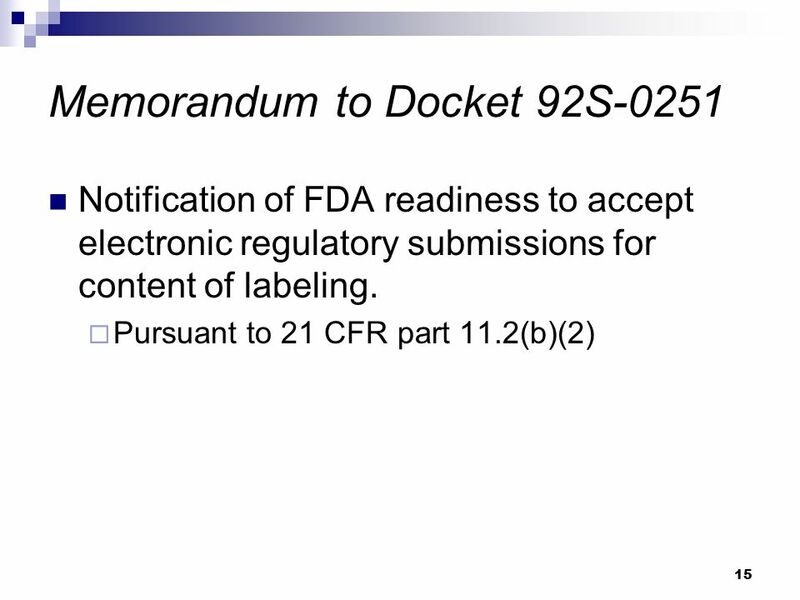 CRC Protocol Documents Protocol Submissions Amendments Publications Study Closure. 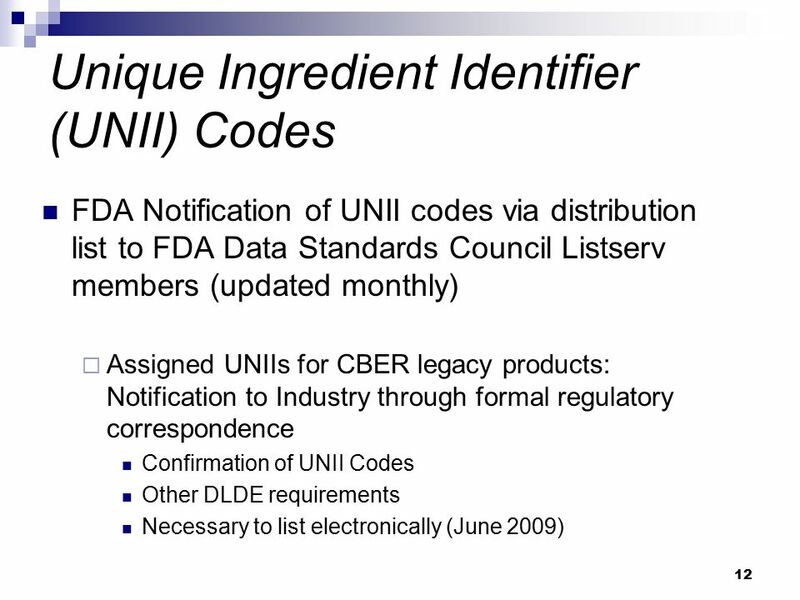 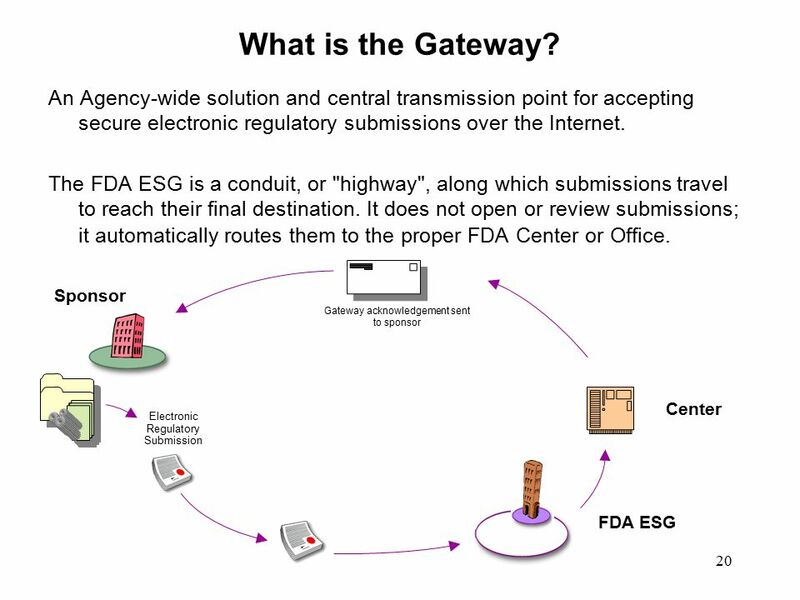 CVM ONADE eSubmitter Program June 5,  CVM achieved the goals of the 2009 Animal Drug User Fee Act (ADUFA) Reauthorization  Provided an electronic. 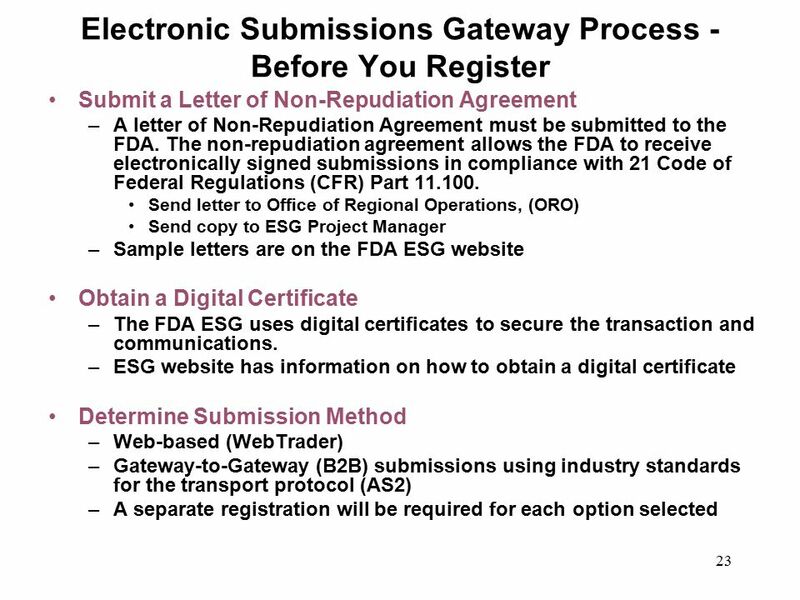 Electronic Compliance Program-Ex-Im Online Training Overview Disbursement Request Submission October 2013. 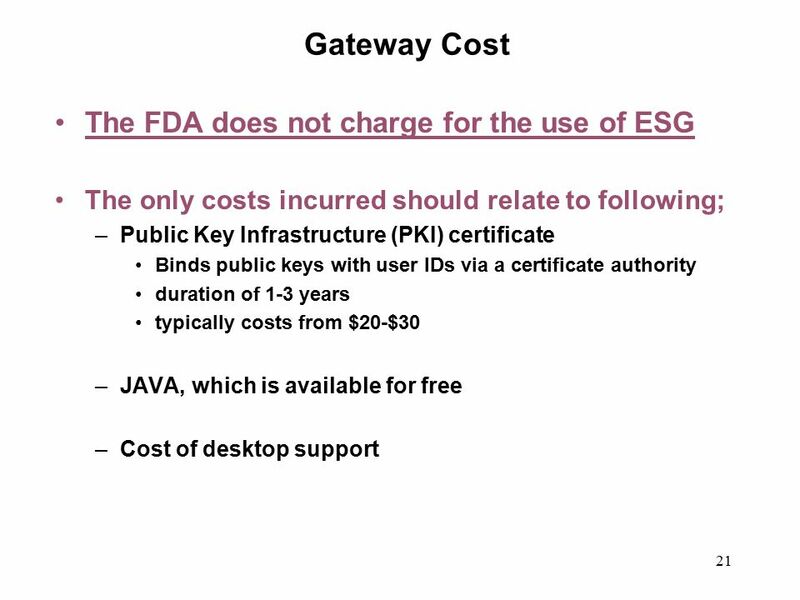 The Final Standards Rule John D. Halamka MD. 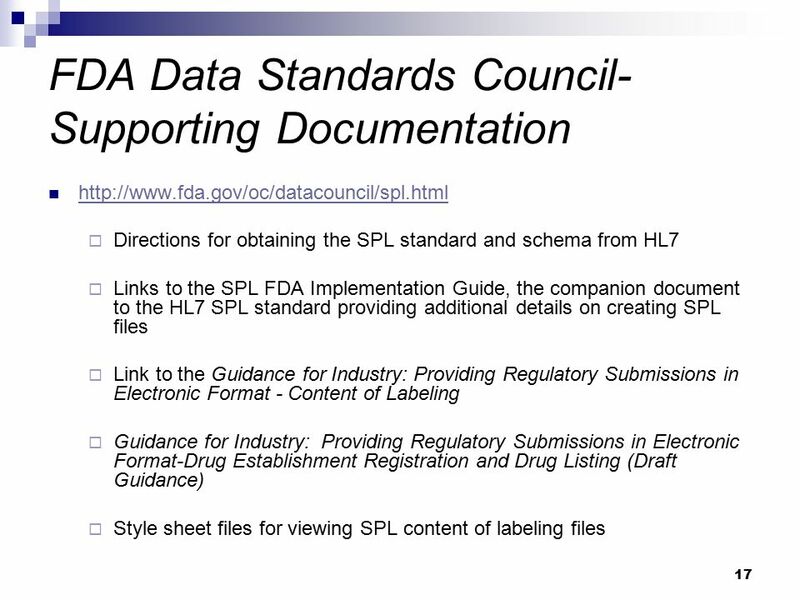 Categories of Standards Content Vocabulary Privacy/Security.